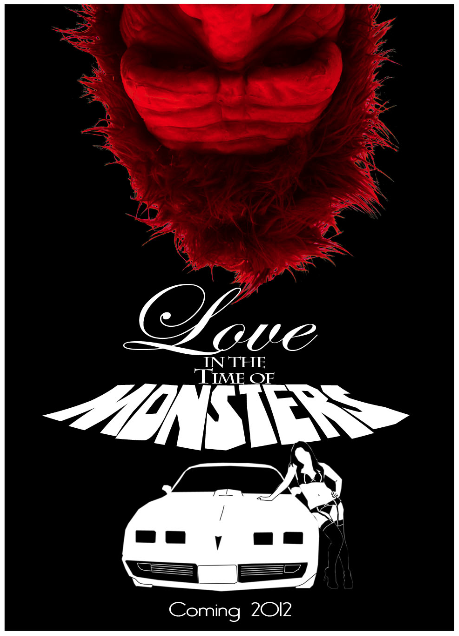 A while back I was asked to work on the test scene for the feature film, Love In The Time Of Monsters. They have finally released the footage and it is FANTASTIC!! Below the jump is a short scene from the movie that starts filming May 3rd in Northern California. I got the call late the night before shooting and got to speak with Robert Pendergraft, known for his special effects in tons of horror movies, about the look that he wanted to create with the infected zombie that dresses up in a Big Foot costume. Left a lot of room for creativity for me and I enjoyed every minute of it! Doug Jones (Hellboy, Pan's Labyrinth), Kane Hodder (Friday the 13th, Hatchet) and Marissa Skell ("Scream Queen") will all star in Matt Jackson's horror comedy, Love in the Time of Monsters. In the film "Two sisters travel to a cheesy tourist trap where they battle toxic monsters in order to save the ones they love." Can't wait to see the finished product after filming! Check out the test scene that I had the honor of doing special effects makeup on below. Very scary! nice job gorgeous!